This space is too lighthearted to get very political or get in-depth about current news events, but with Thanksgiving coming next week, it’s a good reminder to be thankful for whatever you have in your life. And if it’s Thanksgiving, I’m shoving cranberry sauce in my face like no one is watching. I’m of the camp that you need a little sweet with the savory. And while I enjoy pretty much all the flavors that grace the holiday table (except maybe you, green bean casserole), you bet that on every forkful of turkey or potatoes or creamed onions, there is a little bit of cranberry sauce. Ok, maybe a LOT of cranberry sauce. And I’m not picky either. You want to feed me the jello version from the can? Sure, I’ll take it. Or you made a passed down recipe from your great-grandmother that is laced with a little booze? Sure, I’ll take that too. I’ll take them all. So why am I not eating it more often so that when Turkey Day comes I’m not feeding myself like a ravenous zombie? Well, I kinda forget about it. I think the ensuing coma from eating resets my brain every year and I spend the rest of the time oblivious until a week or so before Thanksgiving when I see some ad in a magazine and my mouth starts salivating in a Pavlovian response. This year it was decided that since I have such a short window of time to enjoy cranberries, I’ll make the most of it and enjoy them by not only eating those berries, but also drinking them! In fact, I figured if I made a shrub with them, I’d get to enjoy them a little bit longer (although, it’s so darn tasty I doubt it will stick around for very long). 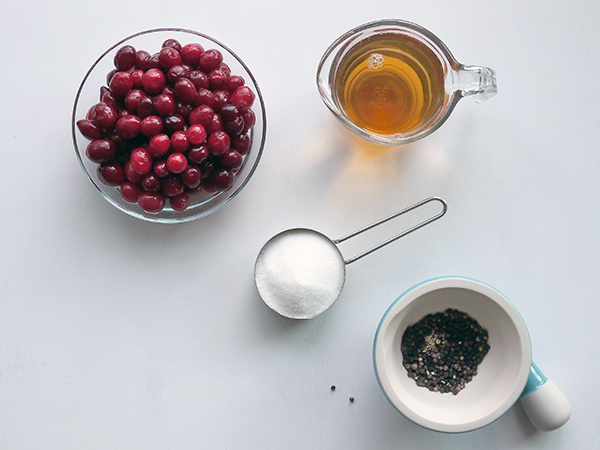 This black pepper–spiced cranberry shrub is sweet, savory, and tart. It mixes up quick and with a fruity sparkling wine and citrusy bitters, the drink works wonderfully to lighten a meal packed with sweet potatoes, stuffing, turkey, and more. And if you don’t use up the whole shrub in one go, it will keep in the fridge for at least a month. 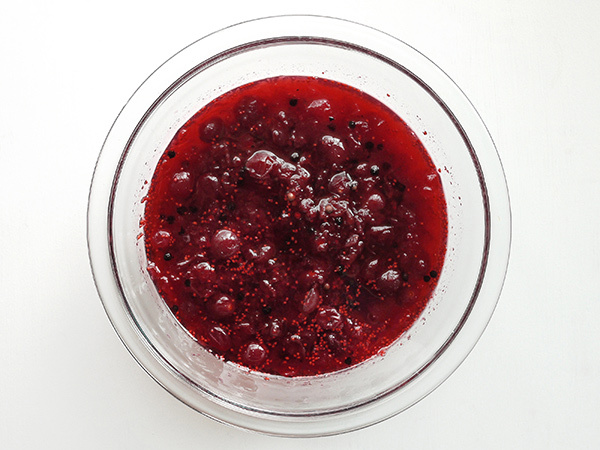 In a nonreactive saucepan, combine cranberries, peppercorns, apple cider vinegar, sugar, and water. Stir to combine. Cover and place over medium-high heat. Cook, opening the lid and stirring occasionally, until sugar dissolves and some of the cranberries begin popping open, about 10 minutes. Remove from heat, uncover, and allow to cool to room temperature, about 30 minutes. Pour entire mixture into an airtight, nonreactive container. Refrigerate at least 8 and up to 12 hours. Strain mixture twice through a fine-mesh strainer, transfer to an airtight container, and refrigerate for up to one month. 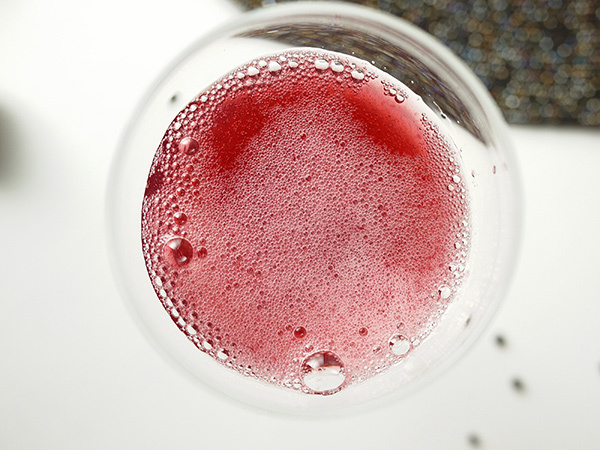 Slowly pour chilled sparkling wine into a pitcher. Add bitters and chilled cranberry-black pepper shrub. Stir very gently to mix. Serve immediately. 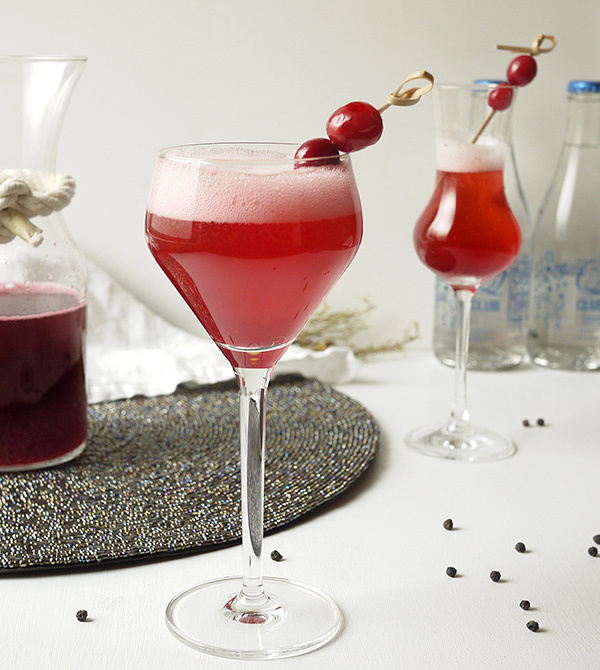 Individual glasses can be garnished with cranberries. Note: For a non-alcoholic alternative, combine 1 ounce of the cranberry-black pepper shrub, 1/4 ounce simple syrup, and 3 ounces club soda (I love Q-Club !) in a wine glass. 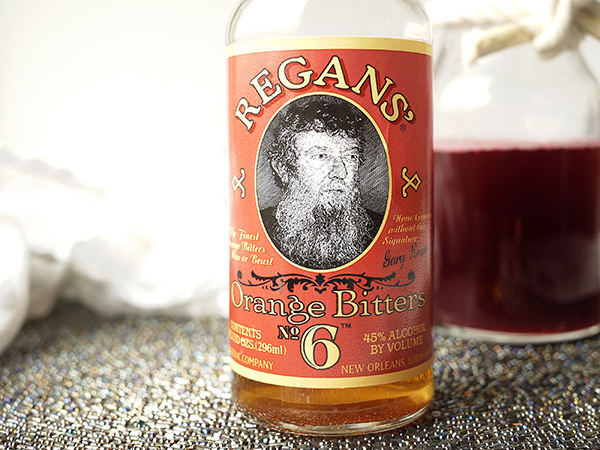 (Add two dashes of orange bitters, if desired—they contain a tiny amount of alcohol.) Garnish with cranberries and serve. This recipe originally appeared on Serious Eats. Previous Post: « Monday Booze News Cereal cocktails! Vermouth flights! Champagne! This looks amazing: Only last night my wife requested a cranberry sauce inspired cocktail for thanksgiving / xmas, so i am thankful! Such an awesome cocktail. I really love cranberry sauce. That’s why i love to drink cranberry cocktails. Also, it has sweet taste. This cocktail includes all my favorite ingredients. 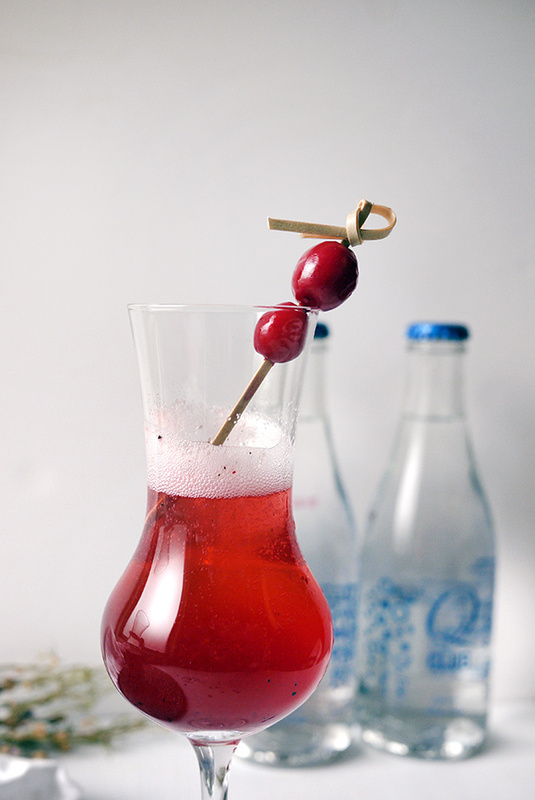 Could this recipe be made with cranberries already juiced, like RWKnudsen’s Just Cranberry? I happen to have both cranberries and the juice on hand, and wondered whether there is something magical that happens when one follows the traditional method that using juice would miss. As I happen to prefer the uncooked style, using the juice appealed for that reason, too. If you’d encourage this experiment, any guidance you could offer would be welcome, as would suggestions for measures of juice, sugar, vinegar. Peppercorns will be included — love that idea! Thanks! Good question. Had to think on this a minute. Mainly, shrubs are another way of preserving fruit (or vegetables), so usually you want to use the whole fruit. That said, I think you should be able to get a good shrub with just the juice. This is my recommendation, although, as I haven’t tried it this way, you may need to alter the recipe and try a second time. I’d keep the fruit juice the same at 2 cups, omit the water, and up the sugar to 3/4 cup (this is more on taste, but I find some straight, all natural cranberry juices to lean on the too tart/sour end of cranberries) keeping everything else the same. Since you mentioned not cooking this altogether, you need to shake this up really well to dissolve the sugar, and I’d increase the resting time a day or more (again, this is to taste). Please let me know how it goes!! Thanks for considering this variation. I’ll let you know how it goes. And thanks again!